As is often the case with more than half of its clients, 10Fold was introduced to AppDynamics when the company hired a new CMO, Steven Wastie, in Fall 2013. Having represented four of Steven’s previous companies as his agency of record, 10Fold got the call again to work with Steven at AppDynamics. This was a tall order, as the company had visions of hockey-stick growth and positioning for an IPO. However, as of November 2013, AppDynamics had a low profile compared to start-up darling New Relic and publicly traded Application Performance Monitoring (APM) giants such as CA Technologies. AppDynamics challenged 10Fold to build industry and category leadership beyond APM, and to deposition legacy providers, especially CA. 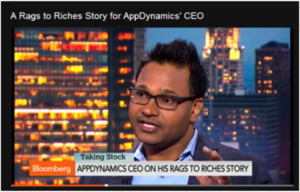 Our initial strategy was to leverage AppDynamics’ founder and CEO, Jyoti Bansal, and to take him on a bi-coastal in-person media tour to meet with top business and broadcast media. This was a critical campaign for the company as it had recently repositioned as the leader of Application Intelligence to rise above the noise of APM (which is more associated with legacy players). In addition to evangelizing the Application Intelligence message to elevate the AppDynamics story from the developer to the CIO buyer persona, we also needed to showcase Jyoti as the face of AppDynamics (as the company positioned for an IPO). In order to gain interest from NYC business media and national broadcast press, we conducted an in-person sourcing session with Jyoti to uncover creative story angles – beyond his tech pedigree as a brilliant engineer in Silicon Valley. We created a clever pitch about Jyoti’s “rags to riches” story as he grew up with humble beginnings in India. We also tied in a “disrupting the disrupters” angle and positioned AppDynamics as taking market share from legacy leader CA, bolstered by company growth statistics and customer momentum. Using this NYC business press tour as a launching pad for our partnership with AppDynamics, we secured 83 original articles in 90 days. Among the marquee coverage was a live national television appearance by the AppDynamics CEO on Bloomberg TV, a feature in Forbes titled “Will CA Survive the Decade?” and a major feature in the print edition of The Wall Street Journal, including a color photo of the CEO. We were measured every quarter on the “share of voice” we garnered for AppDynamics; and ever quarter they kept “upping the ante,” only to have 10Fold continue to meet and exceed expectations. The company grew to become the enterprise-class leader in the APM industry, a recognized leader in Gartner’s Magic Quadrant, and most importantly, a household name nationwide as the company prepared for an IPO.